India has chosen to allow business visa extension for up to a maximum of 15 years and reformation of a normal visa into the medical category in the case of emergency for an immigrant. Rajiv Gauba, Union Home Secretary, told on Dec 04 that the e-Visas number announced had witnessed a tremendous growth through the last 04 years from 5.17 lakh in the year 2015 to 21 lakh till November 30 in this year. Relaxation has been launched in present of internship visa which able to be achieved by a student while still seeking a course in the nation without remuneration, business visa extension exceeding 05 years, conversion of visa into the category of medical in case of an emergency for an immigrant who is now in the nation and permit for immigrants who are on long-duration visas to go to conferences, he told. 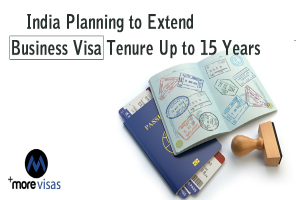 Later, another executive told the business visa can be prolonged up to a maximum of 15 years, for 05 years at a time. The Union Home Secretary, in the conference - 'Streamlining of India's Visa regime', stated that the objective of government is to produce a hassle-free and simple visa regime to promote arrival and stay of international travelers into the nation. Gauba highlighted several policy initiatives demanded to liberalize the visa regime, taking into the record the concerns and recommendations made by several ministries, along with tourism, civil aviation, higher education, health, and other stakeholders. The ability of e-visa now includes 166 nations and foreigners can get the online visa less than 72 hours for travel accompanying to business, tourism, medical health, and conference purposes, he told. Gauba stated the number of visas announced through the e-Visa system is now around 40% of the entire visas number and in the soon it is expected to pass the 50% mark, which is an implication of its popularity.